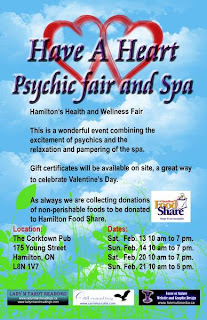 Have a Heart Psychic Fair and Spa is focused on health, wellness and guidance. Overall health involves the balance between mind, body and soul. We are about building beauty inside and out. We also believe in a balance between taking care of yourself and others. We are asking everyone attending to bring a donation of non-perishable food for Hamilton Food Share and help those in need. Sat. Feb. 13 10 am to 7 pm. Sun. Feb 14 10 am to 7 pm. Sat. Feb. 20 10 am to 7 pm. Sun. Feb. 21 10 am to 5 pm. This is a wonderful event combining the excitement of psychics and the relaxation and pampering of the spa. Gift certificates will be available, just in time for Valentine’s Day. We are collecting donations of non-perishable foods for Hamilton Food Share. Please bring a non-perishable food donation and help those in need. Please contact Lady M at Lady M Tarot Readings for any further information. Lady M Tarot Readings provides Healers, Tarot Readers, Psychics and other talent for Corporate and private events. This includes one-on-one readings to parties of five to events of five hundred and more. Lady M Tarot Readings has been providing this service since 1992.